Peggle lovers with Android device rejoice. If you’re looking to play Peggle on Android, Amazon Appstore is giving away free Peggle full game to all Android users (US only though). The free giveaway of Peggle lasts only for today (June 21st, 2011), and is also in conjunction with exclusive launch of Peggle fully optimized for Android platform in the Amazon Appstore, though you can expect it to available soon on Android Market, for a price. Peggle is a casual puzzle video game developed by PopCap and was inspired by pachinko. The challenge player faces in each level of Peggle is to shoot a random but limited supply of balls at the play field of colored pegs to clear out specifically marked pegs. While doing so, player also attempts to achieve a high score through skilled shot planning, or to be Peggle Master. Peggle started to gain popularity and become extremely popular after a demo version of the game, Peggle Extreme was included as part of the Valve’s The Orange Box, and subsequently freely available for all Steam users. Peggle Extreme have enjoyed more than 50 millions download. PowerManager WakeLocks to keep processor from sleeping or screen from dimming. Achieve low-level access to setting the orientation (actually rotation) of the screen. 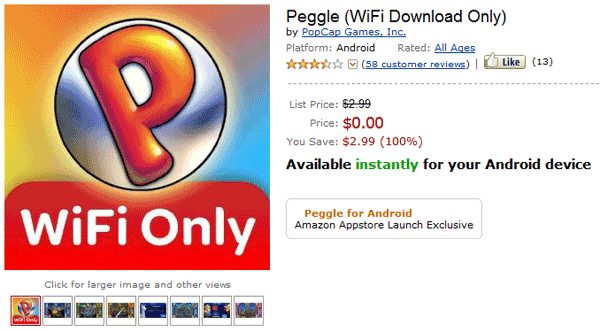 To get Peggle for free, visit the Amazon Appstore page at http://www.amazon.com/gp/product/B0055OQCZI/ref=mas_ty (aff) to get the free app. The offer valid only on June 21st, 2011, and is for US-residents only, as per availability of Amazon Appstore. If you’re non-US residents, you can always use fake credit card and billing address information to register for a payment method that can work to purchase “free” apps and games on Amazon Appstore.